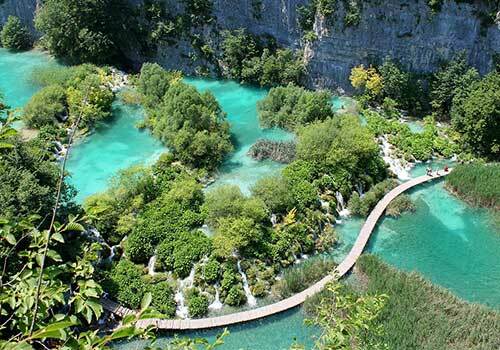 Plitvice Lakes National Park was the first of its kind established in Croatia, and proclaimed as a national park in 1949. Thirty years later the park was added to the UNESCO World Heritage List. 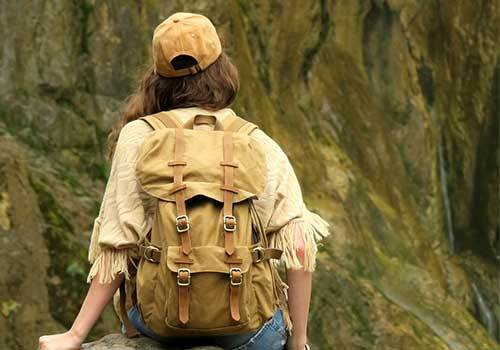 If you are like most North Americans, you have probably never heard of this magical place whereas is a well-known and popular vacation spot with European tourists. Because parts of the park were at one time very isolated and inaccessible, legends grew about this wilderness area, part of which was once referred to as the Devil’s Garden. The most told tale is of the Dark Queen who lived high in a fairy castle on the mountain called Velebit. The valley below and peasants who lived there were experiencing a terrible drought, and the people prayed for rain. Hearing the desperate pleadings, the queen descended from her castle into the valley and brought with her rain, thunder, and wind. So much rain fell it filled not only the dry Black River but also the depressions in the land with water forming a chain of lakes and waterfalls. One lake carries the name of the people who prayed: Proscansko (or prayer). 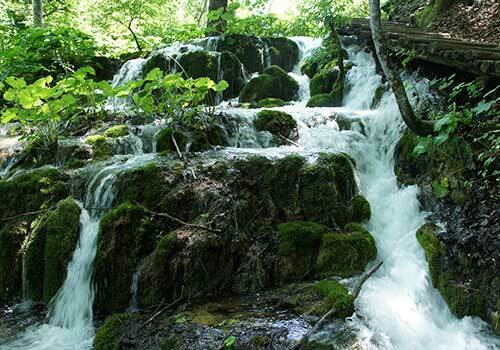 Located between the cities of Zagreb and Zadar in the mountainous middle of the country, the Park is an area of forest, lawns, caves and lakes – sixteen major and many more minor lakes connected with waterfalls and cascades which ultimately flow into the Korona River. The upper twelve lakes were formed on impermeable dolomite; the lower lakes are in a permeable limestone base which has eroded into a deep narrow canyon. Because of the varied mineral deposits in the water, the lakes exhibit a blue-green .spectrum of colors. In the forests, moors and lawns are a rich variety of plant and bird life, and the area is home to a variety of wildlife including bears, wolves, deer, and boars. The park covers an area of three hundred square kilometers or 186 square miles, and ranges from heights in excess of twelve hundred meters (3937 feet) at its highest point to under four hundred meters (1312 feet) at the lowest lake. 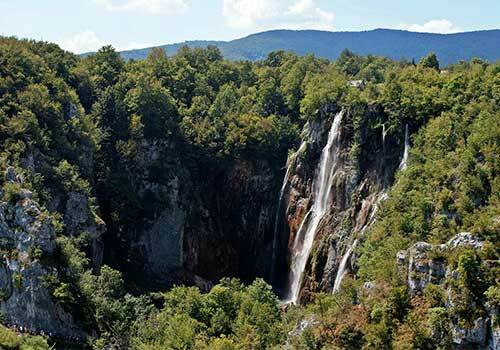 The highest waterfall in the park is seventy meters (230 feet)tall. 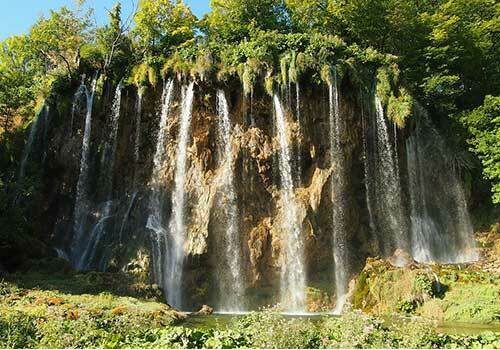 There is plenty to do in the Plitvice Lakes National Park year-round though the upper area is usually closed in winter. There are educational hiking trails with flora and fauna explained by strategically-placed informational signage, self-guided tours along the lakes, bicycle trails, and in winter months there is skiing and sledding on slopes especially suitable for family fun. Swimming in the lakes however is forbidden. You can also purchase guided tours which are additional to the economical entrance fees. The optimum times to visit when the park is not crowded are the shoulder seasons of spring and early fall, and you should plan on at least one full to two days to take it all in. Wear suitable shoes and dress in layers as it can get cool even in summer. Transportation to various points within the park is free with admission, and there are restaurants available though picnics are a great option if you plan ahead. Accommodation is plentiful nearby, and you can travel there by public transport (electric train, bus) or by car. One activity is a must for any visitor: photography. The sights you will see are out-of-this-world so bring your camera or cellphone! Pictures say a thousand words and you will be hard pressed to describe this area of natural outstanding beauty with words when you return home. Visiting this area of Croatia is difficult if not impossible on a cruise itinerary unless you plan on an extended pre- or post stay, and additional travel time. Your best bet is to arrange a custom tour of this part of the Adriatic and perhaps the bordering countries of Montenegro, northeastern Italy and/or Slovenia with your travel professional.